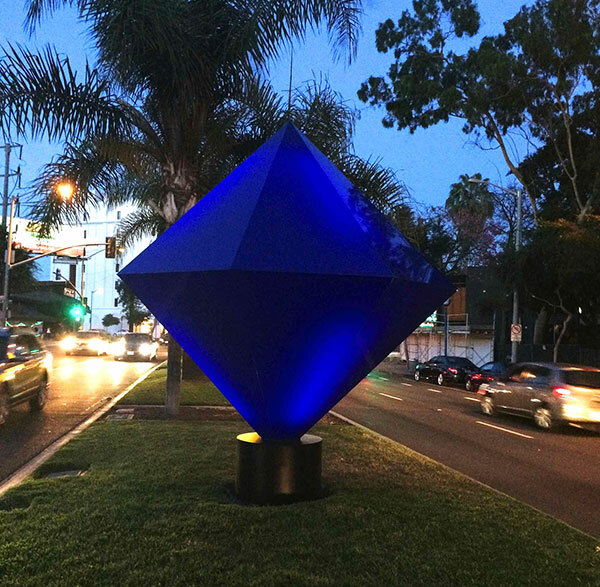 The City of West Hollywood, through its Arts and Cultural Affairs Commission, presents Illumetric—a triptych of massive diamond, cube and rectangle-shaped sculptures brought to the city by Shana Mabari. 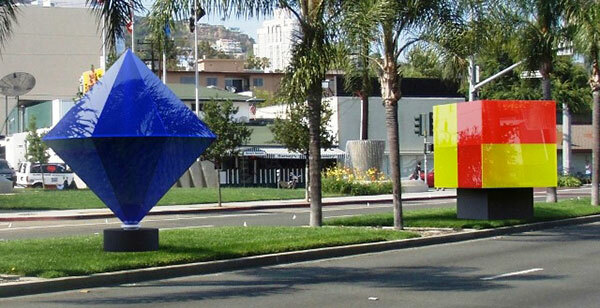 Mabari's latest work is installed on the median of the 8400 block of Santa Monica Boulevard (between La Cienega Boulevard and Orlando Avenue) as part of the City of West Hollywood’s Art on the Outside program (July 2014 through June 2015). Illumetric's diamond, cube and rectangle-shaped pieces radiate colors of red, blue and yellow. Throughout the day they will change from saturated hues to a transparent and ethereal glow as illumination effect takes place after the sun goes down. The pieces capture and interact with the ephemeral qualities of daylight, and feature internal LED illumination for nighttime display, emphasizing light as an intangible but physical and communal presence at any hour. Shana Mabari is a Los Angeles-based artist who explores the intersections of art, science and technology in her work. Her installations and environments investigate ways in which we perceive our world through a skilled orchestration of light, reflection, color contrast and geometry. Her installations and environments investigate ways in which worldly stimuli and phenomena are absorbed and processed through sensory and visual perception. She orchestrates light, reflection, color contrast and geometry to play with and expand the reality and experience of physical space. Mabari's work extends the "Light and Space" movement that originated in the 1960s into the 21st century. To light up the cube and rectangle-shaped sculptures, they used LEDtronics LED T8 tube lights. A total of 48 LED T8 tube lights of lengths from 2 to 4 feet were used in all. The 2-foot LED T8 only uses 9 watts and replaces 16W to 18W fluorescent tube lights. The 3-foot LED tube lights only use 13 watts and replace 25W to 30W fluorescent tube lights. The 4-foot LED T8s only use 18 watts and replace 32W to 36W fluorescent lights. LED T8 tube lights last over 50,000 hours, provide even lighting, no buzzing nor flickering, no harmful UV/IR radiation and no toxic mercury to worry about.